Nokia and the Dark Knight Batman franchise have been buddy-buddy for the last few months and with the movie finally winding down in theaters, it’s about time to add a prologue, no? We mentioned the existence of the Prologue app when the companion Origins comic was released as it was specifically referenced within that app. The app itself is just a mini-comic dealing with some events before the movie. Actually, it’s a bit more than that as it’s called a “motion comic”. A motion comic is basically an animated version of the comic, so it’s like a camera panning and scrolling for you, whizzing past the frames and adding a neat flair to the form. It runs exceptionally smooth and the panning motion even extends to the menu selection, which is done very nicely. It also weighs in at 52MB. There is a ‘share’ function that is quite useless (it just broadcasts that you have the app) and there’s really not much else to it but it gets the job done and is overall, it is well made. We should iterate that prologue won’t ruin the movie if you haven’t seen it yet—quite the opposite as it will further expand the story and give you some background details. Combined with the ‘Origins’ comic and you should have a nice expansion of TDKR universe. 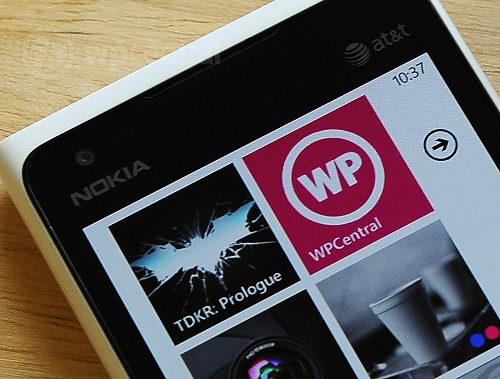 You can pick up TDKR: Prologue here in the Nokia Collection for Windows Phone.